Well here is another video of my son doing his thing. Jon and Trevor came up with a dance called the Dooo Da Dance....and well I caught them both doing it in the garage one night. As you can see Trevor does his thing and then when Jon starts Trevor stops and wants nothing to do with it.....the more I watch this the harder I laugh. Tonight Trevor and I were doing laundry and then 2 seconds later he was gone! Has anyone seen him or know where he might be hiding?? Na, just kidding I found him. He would pick up the laundry basket and place it on his head and then say "mommy come and find me", then I would lift the basket off his head he would say, "peek"!! I tell you what this kid always finds a way to make me laugh, you just never know what he will do next. The one time he did this he sat on the ground very still so if I would not have seen him go into his hiding spot it may have taken me a few minutes to find him. So if anyone needs help with there laundry Trevor is the man to call. Well it has happened again!!! I found Trevor something at a rummage sale that he is in love with. I found a lego table and he thinks it is the best thing ever......he will sit and play for hours and let me tell you for him to sit for that long is amazing. The table, 2 chairs and legos were only $5 and if you ask me that is a great deal. It is amazing to me his hand and eye coordination when it comes to this. He will pull my leg and say "come on mommy, play legos" then he will pull a chair out and say "sit" it is very cute. Have I mentioned how much I love rummage sales!! Well I hope that everyone had a great Memorial Day Weekend!! Our weekend was filled with excitement. Friday evening we took off for the lake (Roy Lake for those of you who do not know) and spent the weekend with Jon's family. It was nice to see everyone again because it was such a long winter and it is just nice to be outside all day. Friday night we just hung out and got caught up at what everyone has been up too. Most of the stups were up until 4am talking smart like normal. Saturday morning was very depressing to get up to really really windy conditions and very cold. The high I believe got to 50....burrrr. So to pass the time we loaded up into 3 vehicles and did some rummaging in Eden for the annual memorial day rummage sales. I think most everyone got some good deals.....including grandma Mydland with her scrap book stickers. Then we headed back the the cabin for some lunch and the boys did some repairing in the trailer and most everyone took a long nap. Then Saturday night we hit the bars with our first stop at Eden were there was a DJ. Since there was not much going on we then headed to Lake City and there they had a live band. That is when the stups starting doing shots and all kinds of crazy things. Tiffany and myself were the ones to make fun of everyone the next night because we stayed sober and drove everyone home, Saturday night also lasted until 4am Sunday morning for most people. Sunday was a nice day so we took full advantage and put the dock in and the boat lift....then Blair took us for a boat ride. After supper Jon, Trevor and I headed home to have a day left to relax. Today we got up and headed to Hendricks to go golfing....we then headed back to Brookings to take long naps (2 hours to be exact). It was a great weekend but it is very sad to see it come to an end. Well today is favorite photo Friday.....I was debating what photo to show and I finally came up with a decision. Trevor's birthday is less then a month away and I bet most of you are wondering what the plan for this year is, well yes I am ahead of the game and have already thought of that. Invitations are printing and I will send them out at the beginning of June......the party will be June 23rd at 3pm at our home. So I always try to do something fun for the invitations and yes it was happened again.......they are SUPER CUTE!!! I had his pictures professionally done and then they made the invitations. They took 56 pictures and because I am a nice person I am going to post only 1 so you can see for yourself how cute they are!!!!! This picture is not on the invitation so I thought it would alright to show it off. I purchased the CD of all 56 pictures so yes Diane, Jenny, Grandma M and anyone else can get tons of copies!!!! I hope you enjoy this very cute picture and have a happy Memorial Weekend! YEAH.......I am back, I heard that some people are going through with drawls, sorry about that. Well this is what has been going on. I closed down my food service operation 2 weeks ago and this summer my building it getting a major renovation....we are getting air conditioning in the kitchen and the bakery and we are also getting a JAVA CITY! So let me tell you it is major.....the total cost of both renovations is over 1.2 million. So I closed down on Friday and I went back on Monday morning to do some work in my office and I walked in and and the construction people said "when are you going to have your office cleaned out"? My mouth dropped because I did not know that this renovation was going to take place in my office too. So in 2 hours my office was cleaned out which left me with no computer......I seriously thought I was going to die. After a week I decided to take my new computer home and hook it up so I could up date files and of course my blog. But this whole week I have been commuting to SF for conferences so I have had no time. But things are getting better and I am back!!! Are you excited, our lives have been really busy and tons of interesting things have happened and I can not wait to tell you everything. Just make sure that you leave a comment when you read a post because I love to hear feedback and I also like to know who is checking things out. I am going to post some pictures of my building so you can see the mess that I am talking about. Trust me when I say this is not what it looks like when we are open for service......I will also post pictures of the finished project in August. Enjoy!! My Office.....makes me sick how dirty it is! 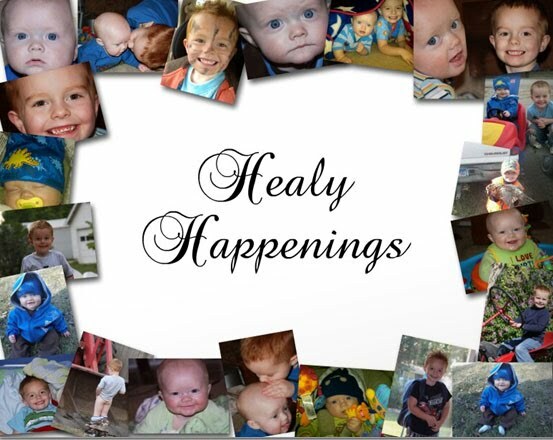 Well it was another crazy weekend for the Healy family. Friday night we stayed home and sorted through our storage unit to organize more stuff. Then Saturday morning we woke up ate breakfast and Jon decided to go turkey hunting since there are only a couple of weeks left. So Trevor wanted to go outside and help daddy load up the pickup and get things ready to go hunting. Jon put Trevor and Mydland in the back of the pickup while he loaded things and Trevor thought this was really cool. At first he sat there and just watched but then as time went on he got more brave and started bossing Mydland around "puppy sit" or else he would say "puppy no" it was pretty cute. 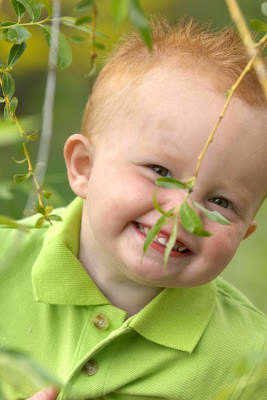 Then once daddy left Trevor and I w ent to Hendricks to see what grandma and grandpa were up too. My dad was working until noon so I took Trevor down there and he walked in and grabbed grandpa's hand and said "come on grandpa, tractors" he loves to go to my dad's work to look at all the tractors. Saturday night Jon and I had a wedding to go to so mom said she would keep Trevor overnight, what I did not realize was that her and my dad had a plan to spoil him rotten. Saturday night they drove over to Brookings to let Trevor pick out his birthday present and then they drove back to Hendricks and put it together. Talk about a spoiled boy......they got him a POWER WHEELS GATOR!! Seriously what is up with that, he is only going to be 2!! But let me tell you he LOVED it, he would just lay on the gas and had no clue how to turn or when to stop it, he went full for ce down the sidewalk the whole time. He was laughing so hard he could not breathe. So needless to say you can figure out what we did the rest of the weekend. Sunday Jon and I went to Hendricks for mother's day with my family for lunch at my parents house and off to Ivanhoe to see Jon's family. It was a very long weekend and Trevor was in bed by 7pm last night sound to sleep!! Oh, for mother's day I got a gift certificate to buy more FLOWERS!! As most of you may know I am a golf addict!! This year I have decided to treat myself to a new driver. Jon's uncle Steve has a friend in Lennox who builds custom made clubs to fit you and that is just what I had him do. All he needed to know was my height so the shaft could be made accordingly. Well the head of the club is a knock off of the new Taylor Made Driver which is over $500 in a golf store but I got it for $160....that is a deal if you ask me. They even personalized it with a Taylor Made graphite shaft...it is SWEET!! I am very excited about this because Jon is the one that always gets new golf equipment, 2 years ago we got him a whole new set, then last spring out neighbor sold him a R7 driver and then he got a new wedge. Me on the other hand has had the same set of clubs since my dad bought them for me in high school. The picture above is of my old driver (on the left) and my new driver (on the right). Can you tell the difference in size? Last night we went golfing, it was my first time all year and man was I pumped. The first couple of holes were rough just trying to get back into the swing of things but let me tell you after that it was SWEET!!! I love this new driver, just the sound it makes when I connect with the ball gives me chills. My old driver was small so it did not make a huge sound when I teed off but that is not the case with my new one, it makes a ping sound. The funny part of the whole story is that Jon was sucking bad with his driver last night so I told him to hit with mine for a couple of holes.....he hit the ball straight down the fairway every time with mine he could not believe it. I am telling you this club is magical! Well it has started again, Wednesday Night is Mom's night. Every Wednesday night Jon golfs league in Hendricks so Trevor and I get to do fun stuff together. My friend Marty also is a single mom on Wednesday nights because her husband works late so we have gotten together in the last couple of years and have taken advantage of no husbands. It is fun now with Trevor getting older and he is also able to do more things. She has 2 boys and they are 4 & 6 so it is fun to see them interact with Trevor. Last night we went out to their house so the boys could play for awhile and boy did they find things to do. They are pouring concrete at their house and so they had a couple of sand piles to level out but the boys found a better use for them. Trevor was not sure what to think to begin with but after a few minutes he was getting dirty with the rest o f them. A little while later Marty and I were visiting and I looked up and Trevor had bolted like a flash of lightening he was gone. I got up in a panic and saw that he had headed toward the sand box and swing set but then once I really looked I saw that he had found the boy's battery operated vehicles and was DRIVING IT!! He hopped right on and took right off, the gas was too the floor. This is funny because my mom and dad had asked me about getting him one of those for his birthday and we were debating if he was too small yet, well I think they got there answer he is ready and he LOVED IT. He had nothing but smiles the whole time or at least until the battery went dead. Jennifer this post is for you. I saw this picture yesterday and I have not stopped laughing since. 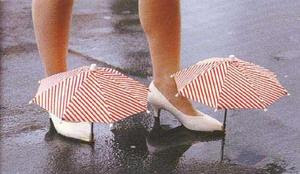 Now why couldn't we of found these for you for last Friday? Well in one of my posts for last week I had said that my mom and dad had sold there farm and were moving into town. Well the weekend we all worked to get things in order has paid off. The house is finished except for a few minor details like putting up the crown molding (which is getting painted right now), putting up the trim and waiting for more furniture to arrive, like a kitchen table (note that they use a card table until theirs arrives). Otherwise the house is finished!! To let you know what we have done, the family room was painted, a new ceiling fan was installed, carpets were stretched and cleaned and new hardwood floor was put in the entry way. The Antique room was painted, new lighting was installed and new hardwood floors were put in. The kitchen was the worst room of all the old cabinets were taken out, it was painted, new hardwood floors were installed, new lighting was put in, new cabinets were installed and it also got new appliances and a new sink. The 4 season's room had a ramp in it that was taken out, the boxcar siding was installed and new shelves were installed to show off my dad's collectible tractors. And last but not least the dining room was painted, new lighting was put in and new hardwood floors were installed. Between my mom, dad, brother, Jon, Kelsey and myself I think we did an awesome job!! Check it out and let me know what you think. Since Jon and I have moved in with Greg he has been working on this project out on his deck and last night he finished it. When he built his house he added a nice big deck off the back and then just recently he added an area for his new hot tub. His old hot tub got struck by lightening so he has been dealing with the insurance company for about 6 months to get a new one. Finally last week his new hot tub was delivered. Once it was in and filled up he could continue the construction around it. Everything that you see he came up with and built, so last night he finished the whole thing including the floor around the hot tub. It looks awesome!! The whole deck is stained except for the floor around the hot tub so we will finish that this weekend. I am proud of him for finishing such a long drawn out project. Now you can see that I have taken the space over and have added my lawn furniture and flowers, wow was I excited to buy flowers this year!! Good job Greg it looks great!! Well our weekend was anything but calm. First of all it was graduation weekend at SDSU so more work for me and on the other hand Jennifer came home for a weekend visit. Thursday night I had to work late and Jennifer flew in late Thursday night and stayed at our place. Friday was not as busy we all met for lunch at Medary and went to a few rummage sales on Friday afternoon then met again for dinner on Friday night. Saturday Jon and Trevor traveled to Ivanhoe for the morning while I was working hard. Then Saturday night we went to Knotty Pine for dinner and they were celebrating Cinco De Mayo and had lots of drink specials. They had a card with 3 beers on it, a margarita and a shot of tequila and if you drank all of those then you got a free t-shirt Jon and Jennifer decided to that. Jon was self-fish and kept his t-shirt but Jennifer was very nice and gave me hers. Thanks Jennifer!! After they were done drinking everything on the card Jennifer was in way better shape then Jon....you go girl! By the time we were done with dinner it was 10pm but Jon, Jennifer and myself decided to head to Flandreau to the casino. There we met up with Marilyn and her friend and did some gambling. Although it was fun we did not win. We then left the casino and headed back to Brookings and had an early morning Taco John's snack....yummy!! Sunday Jennifer left and we all took long naps to recover from the long weekend. It was great to see Jennifer again, the last time we saw her was for her wedding reception in Ivanhoe over Thanksgiving. It was a really fun weekend but holy crap am I tired today. I love this photo of Jon and Trevor!! It was taken this week when we went over to help my mom and dad get things moved into their new home. They had big boxes everywhere and Trevor thought it was fun to climb in them and pretend like it was a fort. When Jon came out to take a break Trevor said "daddy come on" so Jon climbed in and Trevor thought that was so cool and said "Wow daddy Wow"! Well this weekend is going to filled with memories for my family. My parents have sold there farm that they have owned for 17.5 years and lived on for 15 years (I was in 3rd grade). When they bought the place there was an old farm house on it and they moved that house off it because someone else bought that and they built the ranch style house that is on there now. They then added a 3 stall garage on the south side of the property, added another driveway and did nothing but remodel since they moved there. I remember summer weekends were we would do nothing but cut down old trees and plant new ones, I would also mow for days at a time to keep the place looking cute as ever. At one time they had 3 zero turns for all the mowing that we had to do. Sunday they turn it over to the new owner which is going to be very hard for all of us. I know it is going to be harder on my parents then they think. They have purchased a new home in town which just happens to be right next to my dad's parents. (Picture at top) The house is very cute and cozy, it has 2 bedrooms and 2 bathrooms. They took it over last weeken d and we spent the weekend painting every room in the house, putting in new hardwood floor, cleaning carpets and doing more remodeling. They gutted the whole kitchen down to just the walls and so the new cabinets arrived yesterday along with new counter tops. My brother had them all put in my 5pm last night. We went over to haul crap we had in there basement and to help them with a few odds and ends. The last time I was there was Sunday and let me tell you the work they have done since then is unbelievable. The whole house should be finished this weekend when they move in so once things are in order I will post pictures of the finished product. The other thing about this house that I love is the backyard. It is very cute and fenced in, it will be nice for Trevor to play in. I do not have to watch him like a hawk he can just run free. It will be nice when this weekend is over so they can move on with there new lives. We will start with my favorite soap opera.....The Young and the Restless! I love this show I have been watching it since I was around the ago of 12. There is never a dull moment when it comes to this show and if you watch it you know what I mean. Grandma Mydland knows exactly what I mean. The latest is that Phyllis is going to go off the show!! My next favorite is Desperate Housewives!! I am 100% addicted to this show....Diane started watching this before me and one night when we were over there she was telling me the story line and that is all that it took, I was hooked! I still want Susan to end up with Mike and Carlos to go back to Gabby. Brothers and Sister's is the new one that is hard to miss. My mom calls me every Sunday night right at 8:59 to make sure that I have it tuned in. American Idol is an all time favorite! My favorite Idol of all time is Carrie Underwood, she has it all. At the beginning of that episode I knew she was going to get it she was awesome. This year I want Jordan Sparks to win because she is ONLY 17 and is really good! The experts are saying it is going to be the beat boxer. How could we forget Grey's Anatomy?? This show is getting better by the minute. The season finale which airs tomorrow night is going to be a 2 hour extravaganza. 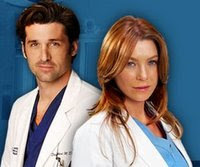 Addison is going off the show because she is starting a show of her own.....and my guess is that the hotty on the left is going to dump Meridith to become chief of surgery. 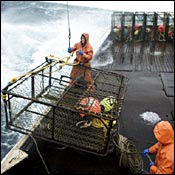 Deadliest Catch I starting watching because of my husband, he watches it every night and now I am addicted....as if I need another show to watch. He is so interested because these people go out to sea to catch crab for 2-3 weeks at a time no matter what the weather is and bring home $70,000 + home with them. Jon says he should find a job like that. I say whatever, on almost every show at least one person is badly hurt or someone even dies. That is not enough money for me to risk my life. Big World Little People I started watching because all the other manager's at work watch it and they all sit and talk about it and I had no clue what was going on. This show is very cute....the mom and dad are small people and only 1 of there kids is small and the other 3 are normal. They have this huge pumpkin farm in Oregon and the show is about how everyone thought they would never make it because of there situation but they did make it. The show is on TLC. And last but not least The Bachelor.....wo baby! I have not watched the last 3 episodes because we have been really busy but when I have time they are on DVR. This guy is a hotty and has it all (although he is not as good looking as my husband). I watched last season and the bachelor was a prince but I hated the ending because he proposed but said it was a promise ring and he wanted to get to know her better. I mean come on you wanted to go on reality tv make it happen. Well last night the weather was AWESOME so Jon and I decided to take Trevor to the park. He had a great time!! When we got out of the car he ran as fast as he could to the slide and being the brave sole that he is he went right up and came right back down about 50 times!! Then it was time to go to the big boy slide which had lots of turns and t wists and he thought that was so much more fun. At this point Jon and I were tired of taking turns and going up the slide steps with him so we headed for the swings and he was laughing so hard that he had spit flying out of his mouth (see picture). So by now we are very tired but Trevor is still going strong so we just let him run and climb on top of the animals and play in the sand. By the time we got home I am not sure who was more tired Trevor or mommy and daddy. Jon and I voted and auntie Jenny and grandma can take him to that park Friday afternoon!